Finding a decent meal in Covent Garden is like finding a needle in a haystack. For every Hawksmoor or Dishoom, there are at least a dozen chain restaurants, half-hearted brasseries and tourist-trap steakhouses. Finding a decent pizza is even harder, with most of the slice-based action restricted to the sickly-looking specimens found sweating in the cafés surrounding Leicester Square tube. 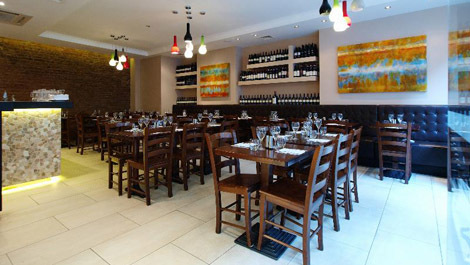 However, salvation can be found tucked away on Great Newport Street where Italian restaurant and pizzeria Sartori occupies a sleek, split-level location. Initially, you could be forgiven for dismissing the place as another soulless spaghetti house – the menu is worryingly long, and nothing about the exterior hints at the pizza-making prowess within. However, appearances can be deceiving. The restaurant’s lower level houses a sizeable wood-fired oven, serving up a mixture of individual and by-the-metre pizzas. Encouraged by our waiter to opt for the latter, we ordered a three-quarter-metre combination of Napoletana (olives, anchovies, capers), Toscana (salame, sweet peppers) and Rustica (a Bianca pizza, boasting the classic Neapolitan combo of spicy sausage and friarielli, a type of wild broccoli). Pleasingly, our pizza was in and out of the oven in less than two minutes, producing a blistered, tacky crust, with a stretchy base that was juicy but not soggy. All of the toppings tasted extremely fresh, and flavours were well-balanced throughout, if a little salty in places. The Rustica was particularly mouth-watering, with fragrant fennel notes setting off the ground sausage a treat. We also ordered a Rotolo Rustico, a kind of rolled pizza similar in style to a calzone. Whilst the ingredients were of a similarly high standard to those used on the pizza, the excess of cheese and dough was cloying, the whole thing sitting rather heavily in the stomach. A bruschetta starter was similarly unremarkable, but the Marinara-style pizza bread offered a tomato hit of considerable tang, a welcome alternative to your run of the mill garlic bread. At around £10 per pizza, Sartori is extremely good value given its central location. It’s also worth noting that the restaurant accepts Taste Cards, meaning that our bill could have been slashed by a further £20 or so had we thought to bring one. For authentic pizza-by-the-metre of this quality, it’s an absolute steal, and well worth seeking out next time you fancy a pre-theatre bite. 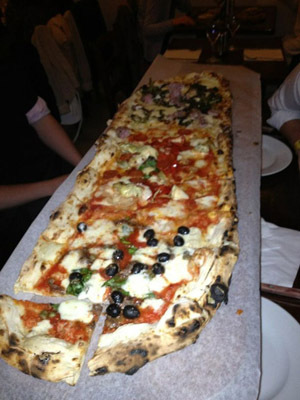 This entry was posted in Central London, Covent Garden and tagged Neapolitan, Pizza, Pizza-by-the-metre, Sartori, Taste Card, Wood-fired by thelondonpizzablog. Bookmark the permalink. 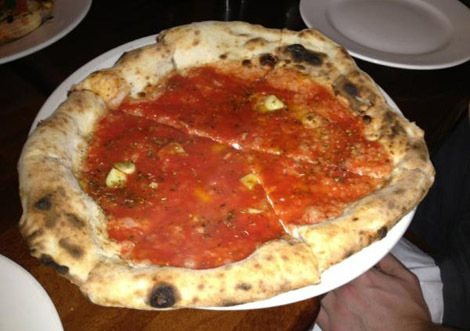 This pizza is very much a Napoletana Style, it is very nice to eat, it is very much tasty to eat. It create a intention in me to have this dish.